We all might know that the evolution of bacteria or life started from ocean floors with deep residing phototropic bacteria evolving oxygen for life and provided us oxygenated atmosphere. Does there are still some old or new evolving bacteria much beneath the ocean floor? The only way to reach there is to drill by meters of sediment until you hit hard rock. 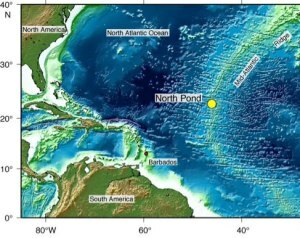 A new study published in the journal Scientific Reports proves that there are active microbial community still present in cold oceanic crust of North Pond on the western flank of Mid-Atlantic Ridge. The team of researchers led by Marine Biological Laboratory Associate Scientist Julie Huber provided evidences to understand life in new way deep down under. Oceanic crust is static, where seawater runs through the crevices of the rocks creating a dynamic aquifier to support this microbial community persistence. From the samples collected, Huber team found that they are oxygenated, heterogeneous and markedly distinct. Several species is residing at the same group, i.e. there are distinct differences in potential microbial activity between two sites of collection. Team for the first time propose the microbial life presence in cold crustal aquifer site. Previous work describes about hot volcanic fluids in mid and subsea floor microbial persistence. Huber describes that the cold crustal aquifer is different environment and holds importance not only about sustaining microbial life but also biogeochemical cycling.